An educational and outreach program for those who love and speak for the woods. Promoting sustainable stewardship of our natural resources through scientifically-based forest and wildlife management practices. The purpose of the program is to train volunteers in the principles of forest stewardship and how sound forest management practices can result in healthier forests, more diverse, healthier and abundant wildlife, help improve and protect water resources, and enhance recreational opportunities as well as providing and improving many other benefits of the forest, too. In exchange, volunteers share what they learn with other forest landowners and interested groups and individuals throughout the State. 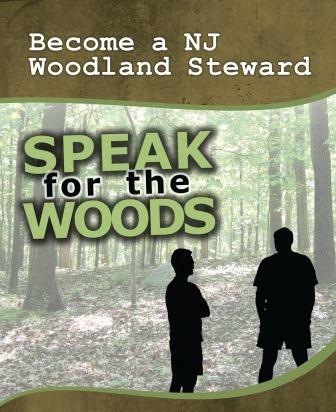 Please read this website to learn more about the New Jersey Woodland Stewards Program, and then decide if you are interested in joining this select group of dedicated volunteers. Each year a select group of 25 individuals is chosen from an applicant pool to participate in a three-and-one-half-day workshop that emphasizes "education through demonstration". The next training workshop will be from September 27-30, 2018. Through this intensive workshop, you will learn about the ecology and management of New Jersey's forests and wildlife, sources of professional assistance to help them, and how they can put this information to work in their communities. Covered topics include principles of stewardship, silviculture, growing forest trees, forest and wildlife ecology and management, tree identification and measurement, legal issues and outreach strategies. Field sessions are also scheduled to see examples of forest management practices and to observe how the concepts discussed earlier in the seminar are applied "on the ground". To register for this year's program, please click HERE.